Get the right billboard advertisement design specs. 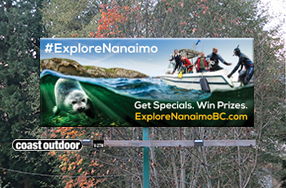 Billboard locations in our network use horizontal poster-sized creative that is either 10'x20' or 10'x24'. Except in the case of campaigns of under 8 weeks in duration, designs are produced on flex-face vinyl. Short-term campaigns often use paper posters. Consult with the person booking the campaign to get the size (or sizes) of design creative required and whether the creative will be produced on flex-face vinyl or paper. The template or templates you'll be using to design the production-ready creative differ depending on the size of the horizontal billboard and the production media. Take a peek at our billboard advertising tips. Deliver your production-ready design files by Wetransfer. Transfer your production-ready creative package.